-Steck was considered by many to be one of the strongest climbers who ever lived -The holder of six amazing speed-climbing records -The first and only English-language book by this much loved alpinist A climber of incredible strength, Ueli Steck set climbing records for speed and endurance that no one had previously thought possible. 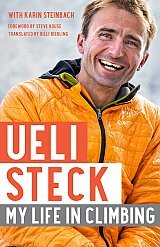 This deeply personal and revealing memoir, Ueli Steck: My Life in Climbing, is the only one of his books to be published in English. In 2016, Ueli established a new speed record on Eiger's North Face - beating his own record! That same year he climbed all 82 four-thousand-meter peaks in the Alps within 62 days (traveling between the peaks by bicycle), and summited Annapurna's south face in 28 hours. But the dramatic events of the previous two years - the internationally reported conflict with Sherpas at Mount Everest, and the discovery of Alex Lowe's body on Shishapangma - changed him and made him rethink his approach to the mountains. After withdrawing from the sport for a period, Ueli rediscovered his love of climbing, and in this memoir he explains how his perspective changed. While his drive to achieve in the mountains hadn't diminished, an evaluation of his experiences helped him find a new way to process the emotional and mental challenges that shaped his athletic outlook. Structured around key climbs, Ueli Steck: My Life in Climbing provides the history of each mountain and route, Ueli's reasons for attempting it, what happened on each climb itself, and what he learned from the experience. It also includes some fascinating insights into his training regimen. Ueli infuses his story with the joy and freedom of climbing and running. He is honest, direct and, at times, exhibits the self-absorption common to many elite athletes. Ultimately, however, his experiences brought him to a place of self-awareness and he was no longer the same climber who first set the speed record on the Eiger's North Face. Ueli was determined that he would take only acceptable risks. Unfortunately, Ueli's bar for risk was still very high?he died while on a training climb on the Himalayan peak Nuptse on April 30, 2017.